The island of Saint Lucia was originally colonised by the French in the 1600's, only to end up swapping many times between the French and the British, until 1814, when Britain was able to claim the island, and keep control. 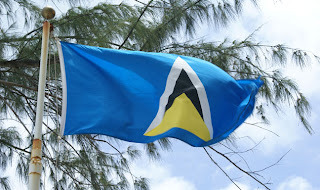 In 1875, it was granted its blue ensign flag, which was updated in 1939 with the new coat of arms.This was a black shield crossed with 2 pieces of bamboo in yellow. In each canton, either an English Tudor Rose, or French Fleur-di-Ly. Signs of the islands history with France and Britain exercising control over the island at different points in its history. From 1958 to 62, the island was part of the larger Federation of the West Indies, and finally gained its independence from Britain in 1979. The flag that was introduced, was a blue field with a central image. 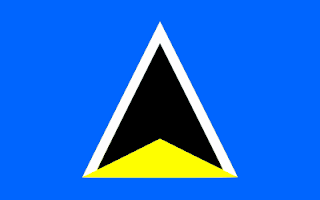 The central image features a black triangle, with a smaller yellow triangle. Also, the black triangle is fimbriated in white. 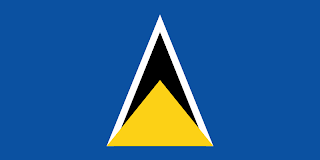 The blue stands for the ocean around the island and fidelity, the yellow represents sunshine and prosperity, the black and white represent racial harmony between Africans and Europeans on the island, though the positioning of the black triangle is for the dominance of black culture on the island. 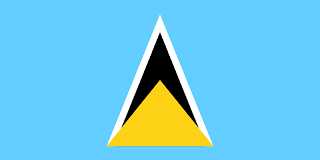 In 1979, the flag was altered slightly, with the shade of blue being darkened, and its dimensions being changed, with the flag being lengthened. In 2002, the flag underwent another alteration with the shade being lightened to the colour in use today.